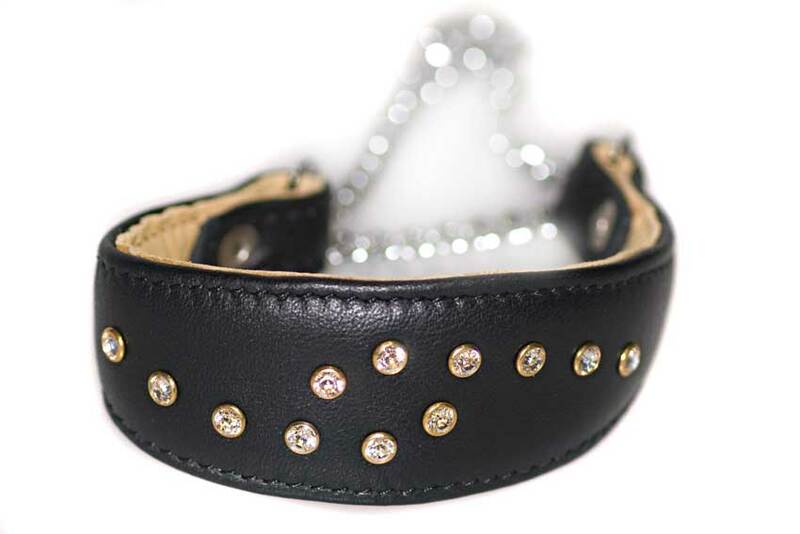 The ultimate in luxury and comfort, this leather martingale (half-choke) collar with chrome-coloured chain is set with real Swarovski crystals. Martingale hound collars, also called half-choke or humane choke collars, give you extra control and security by preventing your hound from slipping out of the collar and escaping. They are ideal for all hound breeds from the smallest Italian Greyhound to Saluki and the largest Irish Woolf hound. 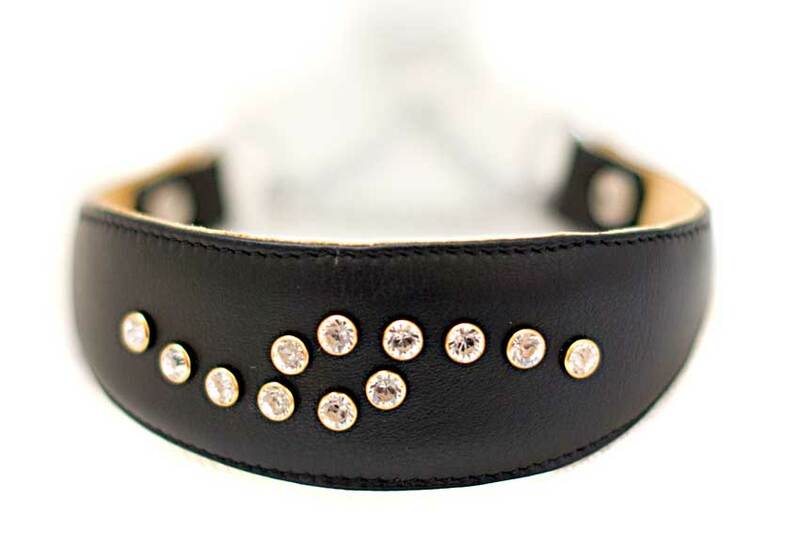 All Dog Moda hound collars are very soft and padded for extra comfort, and Swarovski martingale models are no exception. 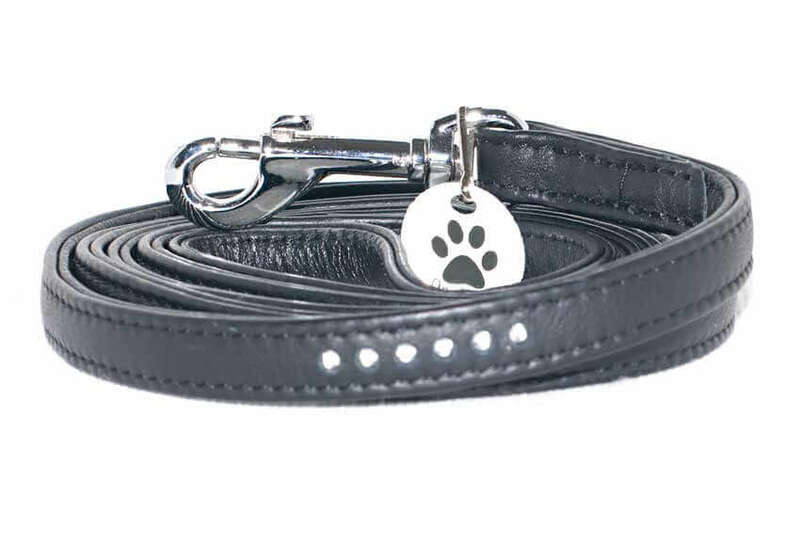 This black leather martingale hound collar is fully lined in softest cream leather and is fully padded for ultimate comfort. Currently this martingale collar is available in sizes XXS, S and L.
Please do not hesitate to call +44 (0) 20 3582 4532 or contact us if you need help in choosing the correct size collar for your hounds. We are here to help! Black leather lead with 6 crystals to match our black Swarovski martingale hound collar. This stitched real leather dog leash is made from soft nappa leather that is folded four times for extra strength. 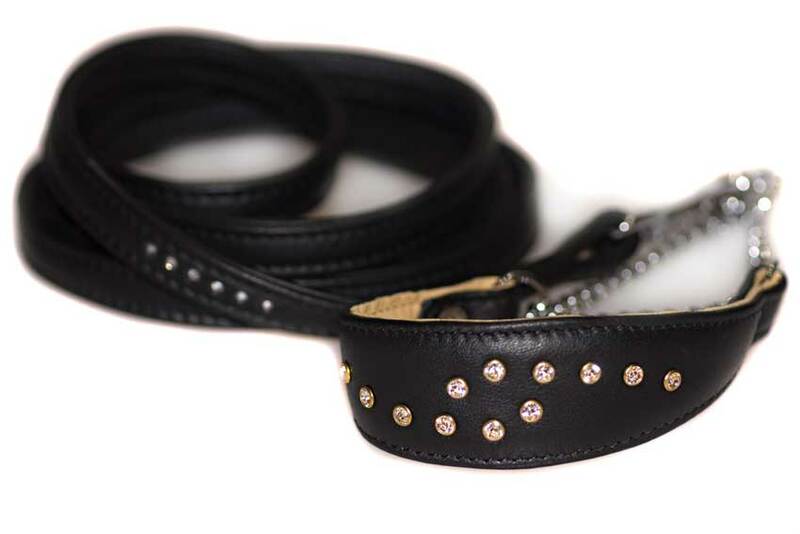 Black leather dog lead with crystals is 1.50 meters / 5 feet long, 13 mm wide and has a chrome trigger hook. Decorate your hound's collar with one of our exclusive collar tassels and save £5.00 off tassel price. Dog Moda tassels are designed and handmade exclusively by us in the UK. 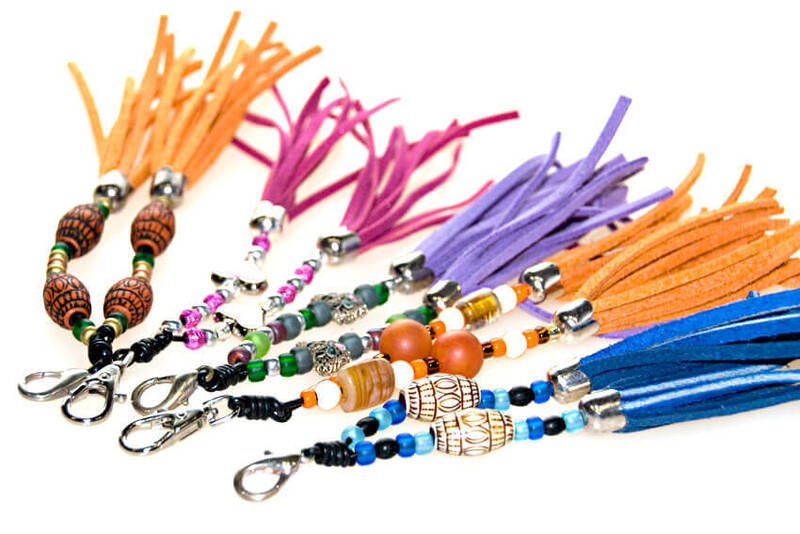 Our tassels are available in a wide choice of colours designed to compliment full range of Dog Moda hound collars. You can choose from blue, pink, orange, red, green, lilac, turquoise, beige, brown, black and white. Please select select your choice from a drop down menu. We are also happy to accommodate custom requests should your colour choice be unavailable and can also use letter beads for a truly personalised tassel. Carefully measure your dog's neck using a soft tape measure or piece of string where you want the collar to be worn (either just below the chin or lower down around the neck). 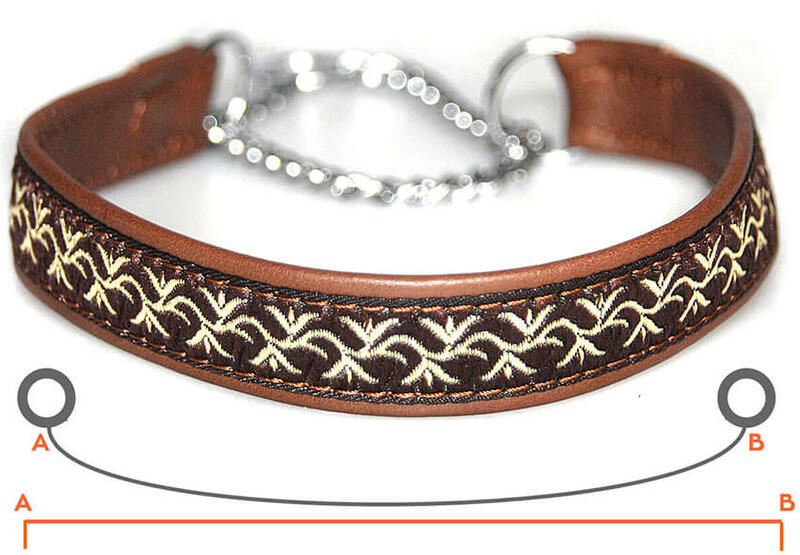 This will give you A to B measurement, which is the leather part of martingale collar without the chain. Our martingale collar sizes are given as distance between the two chain rings without the chain (measurement of leather collar between A and B). Therefore, you need to ensure that tape measure is snug and sits tightly around your hound's neck with no space to spare. Bear in mind that collar chain gives sufficient extra length for control, comfort and ease of putting the collar on. Please do not hesitate to call +44 (0) 20 3582 4532 or write to us if you need help in choosing the correct size martingale collar for your hounds.